Getting involved in a professional association can support your professional growth and development in many ways. By becoming involved you will build connections and tap into networks in the student affairs profession and build relationships with colleagues that can lead to further opportunities. In addition, you will have the opportunity to shape and influence knowledge building and resource sharing within and among your area of expertise and interest, connect with knowledge leaders outside of your professional knowledge area or job function and build important skills including learning about committee work, governance, project management. CACUSS has a long history of member involvement. We would not be who we are as an organization today without thousands of hours of volunteer time contributed by members. However, involvement does not have to be a long term or onerous commitment. Check out our organizational structure, to get a picture of how CACUSS is currently organized. Current opportunities recruiting member participation are highlighted below. For more information, please contact cacuss-ed@cacuss.ca or contact@cacuss.ca. 2019 Call for Nominations/Call for Applications Now Open! If you have questions about the Director or Committee positions, you can email Pat Pardo, Past-President, Chair Nominations, Elections, Leadership Development Committee at ppardo@mtroyal.ca. Nominations close on March 27 at 4 pm ET. The CACUSS Board of Directors is comprised of 9 members. The CACUSS bylaws (**see below) outline the structure of the Board, and the organizational structure chart above also illustrates the Board. As a director, you are elected* by the membership to oversee the Association as whole. A director is responsible for fiduciary oversight of the operations of CACUSS as well the development of strategy (planning), policy, and legal duty to oversee the management of our stated objectives and activities. *there is one appointed director position. ** The bylaws have been updated as of February 4, 2019. They are effective as of this date, however bylaw changes must be approved by the membership at the 2019 Annual General Meeting. If not approved, the organization reverts to the previous bylaws. You must submit a nomination application with the support of two members in good standing. Nominations close on March 27. Applications are due to contact@cacuss.ca. Directors are elected at the Annual General Meeting in May/June (date posted on website 90 days in advance). Directors are expected to attend regular meetings (every 4-6 weeks via teleconference), two in person meetings (in October/November and in May/June at the annual conference), and participate in committees as required. Director must complete an orientation at the start of their term. Director terms are 2 years. Click here to complete your nomination. You must submit your nomination via email to contact@cacuss.ca, which must include name, institution, contact information, position, as well as name and contact information for two current members who support your nomination. You may also choose to provide us with a photograph by emailing it to contact@cacuss.ca. Applications are due March 27 at 4pm ET. All committee positions will be confirmed by May 1. Appointments will be effective July 1, except for the Program Committee which will be effective May 1. The Program Committee leads the planning and development of the annual conference of CACUSS. The committee’s responsibilities include developing the theme, researching and recruiting keynote and featured speakers, developing innovative educational programs, overseeing the review of concurrent educational submissions, and assessing the success and outcomes of the conference. Participation on the Program Committee is a 16-18 month term. There are opportunities to lead and participate on 34 sub-committees of the Program Committee. Currently accepting applications for interest for the 2020 Program Committee. Click here to apply. The mandate is to provide strategic recommendations, advice and guidance on the finances of the organization, to ensure equitable and accountable financial planning, and to support the development and implementation of strategies to ensure long-term financial strength and health of the entire organization. Currently accepting applications for interest for the 2019-20 term. Click here to apply. The Policy Committee is responsible for drafting and reviewing operational and other policies which help the Board of Directors, staff, and volunteers manage their roles in a responsible and transparent manner. The committee will meet regularly (3-6 times per year) and make recommendations to the CACUSS Board. Currently accepting applications for interest for the 2018-19 term. Click here to apply. The purpose of the Research Committee is to provide leadership to CACUSS on research related matters and to promote strategic planning for research activities within CACUSS. The Research Committee aims to grow Canadian student affairs’ research capacity through professional development, setting CACUSS research priorities and to support research projects through the provision of seed grants. The Professional Development Committee will make recommendations and lead initiatives that support the learning and professional growth of CACUSS members. The committee will focus on developing a comprehensive professional development plan for the organization which is both innovative and financially responsible. The Editorial Committee works collaboratively on content development, solicitation of featured articles and authors, and recruiting members to contribute stories of interest to the magazine. The committee oversees the publication timelines and works with the staff and copy editor to ensure delivery of magazine to members. Applications are now being accepted for the position of Co-Chair for the CACUSS Networks and Communities of Practice. Communities of Practice and Networks provide a space for CACUSS members to come together and share common interests, concerns, and goals. Communities aim to create and share knowledge, foster and promote relevant research, design and deliver programs, participate in advocacy, and/or support professional networking. 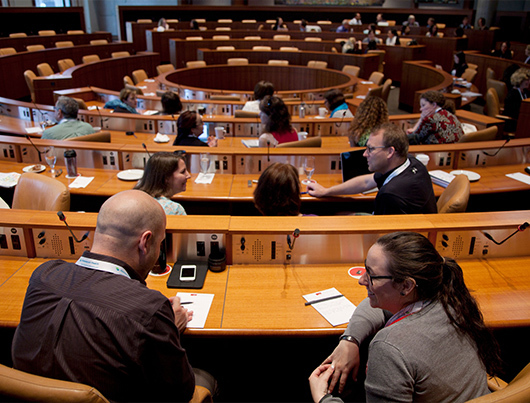 Each Community of Practice or Network is led by two Co-Chairs, who are responsible for liaising and communicating with members, representing the Community or Network at the Assembly of CACUSS Communities, and providing leadership for Community or Network activities, research, and/or advocacy. Review the list of Co-Chair vacancies below. Get more information about the Community or Network by reaching out to current Co-Chairs or the CACUSS Board or Staff listed below. While you are waiting for your application to be reviewed between April 5th and April 18th, head to https://www.cacuss.ca/membership/index.html. In order to be a Co-Chair for a Community of Practice of Network, you must be a CACUSS member prior to the beginning of your term. You will hear from the current Co-Chairs regarding the outcome of your application by Tuesday, April 23rd.